It’s International Day of Peace, a globally shared date to commit to peace and set all differences aside with the ultimate goal of creating a better world for all. 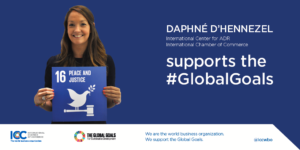 The International Chamber of Commerce has been championing to nurture peace, prosperity and inclusive growth for close to 100 years. 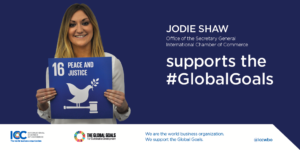 To celebrate Peace Day here are 6 areas where ICC has been making a difference and contributing to United Nations Global Goal number 16, Peace and Justice. 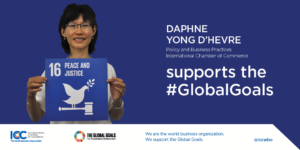 ICC works to ensure that businesses actions and investments drive the implementation of the United Nations Sustainable Development Goals (SDGs), including Global Goal #16 for ‘Peace, Justice and Strong Institutions’. 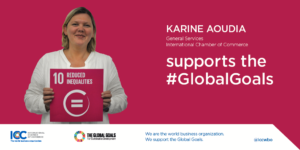 It is estimated that achieving the SDGs opens up US$12 trillion of market opportunities which is why we believe they should also be known as the Business Development Goals! The multilateral trading system has helped improve the standard of living of billions of people worldwide. But trade tensions today are contributing to increasing pressures on the global economy. In the belief that reform not retaliation, is needed to avoid damaging trade wars, ICC is working to promote the benefits of trade and help governments chart a new course for trade policymaking. The ability to resolve commercial disputes peacefully has been a core activity of ICC since it created the International Court of Arbitration over 95 years ago. To date, the truly neutral and independent ICC Court has helped to resolve over 23,000 commercial disputes in over 140 countries and. In 1950, ICC submitted a first draft of the New York Convention on the Recognition and Enforcement of Foreign Arbitral Awards. Described as the most successful treaty in private international law, the New York Convention is adhered to today by more than 140 nations. ICC employees hail from over 30 countries, and work in tandem to create solutions that promote international security and prosperity. Our tolerant and inclusive work environment attracts and develops talent from all over the globe and encourages all voices and perspectives to be heard. Working in this diverse environment means that even the most skeptical among us can have hope that a day will come when conflict between countries is a thing of the past, as we enter a peaceful and more prosperous new world.